A counterweight is included with your Porter Cable 7424. This is a replacement counterweight. 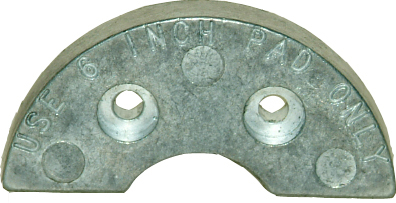 The counterweight fits on the eccentric housing, located just above the backing plate. This is the part that causes the plate to orbit. The semi-circular weight orbits with your backing plate to balance out any irregular motion and make the Porter Cable operate more smoothly. With the addition of a counterweight, your Porter Cable 7424 will work like a charm and render a perfectly uniform finish every time. Only found one place to find a 5 inch counter weight. Want to use my 3 inch backing plate for motorcycle. 5 inch is what needs to be stocked. Only use 6 inch backing plate for buffing bonnet anyway.